I’ve made baked oatmeal on and off in the past, but I’ve always felt a little iffy about how much sugar most baked oatmeals contain. 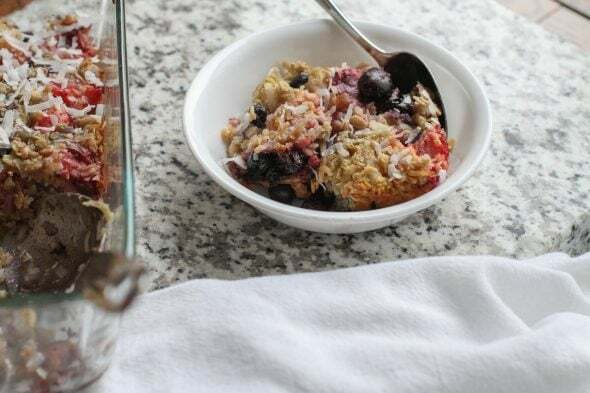 However, in a January edition of Mandi Ehman’s newsletter, she shared a not-so-much-sugar-in-it fruity baked oatmeal recipe, and we really love it! I’d never have thought of putting fruit in the oatmeal, even though I regularly add fruit to my normal oatmeal bowls. We’ve added peach slices, mango, blueberries, strawberries (I slice them first), and raspberries, and they’ve all been good. 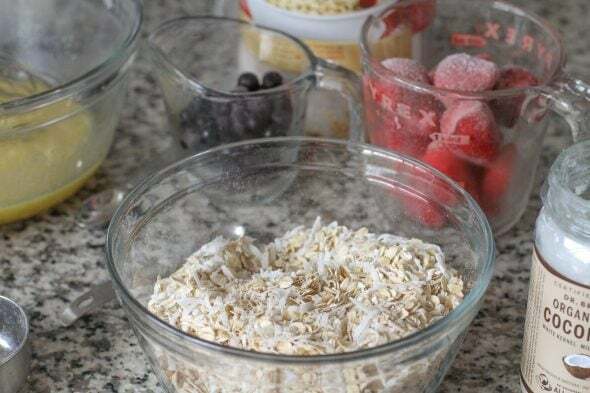 And since the oats sit overnight in the fridge before baking, you can feel free to just stir in frozen fruit, as it will be nicely thawed by morning. I also really love the shredded coconut in this recipe. Again, I wouldn’t have thought of it, but it’s so good! The original recipe called for olive oil, but try as I might, I really do not love olive oil. So, I use melted butter instead, or a combo of coconut oil (melted if it’s solid) and melted butter. 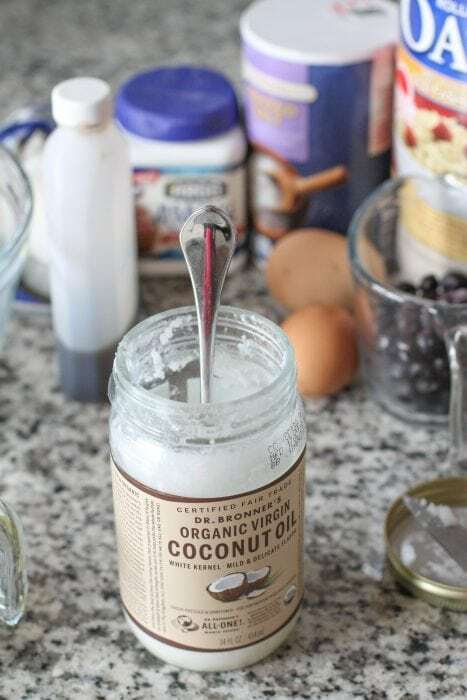 In a large bowl, combine your fat (melted butter, coconut oil, or a combo of the two), sugar, vanilla, eggs, and milk. 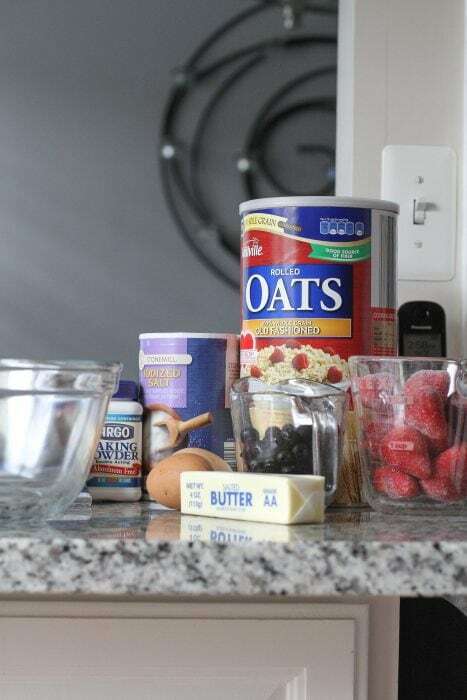 In a second bowl, mix up your dry ingredients (oats, shredded coconut, baking powder, and salt). Dump your dry ingredients into the wet ingredients, and mix to combine. Then fold in your fruit. Fair warning: if you use frozen blueberries, your previously pristine oat mixture will become a bit unsightly. If I’m using a combo of fruit, I mix in the other fruit first and then add the blueberries at the very end. I mean, it doesn’t matter from a taste perspective, but the oats do look nicer when they’re not blue-ish green. The lid is super handy for the overnight refrigeration. 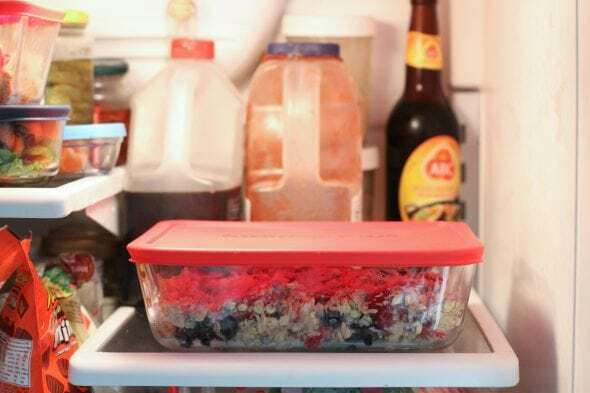 Cover your dish and refrigerate overnight. 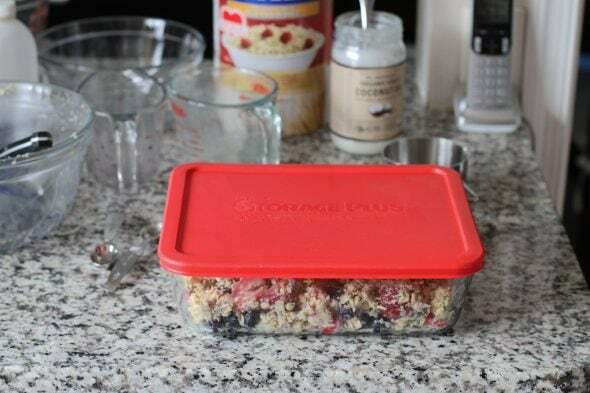 In the morning, take the lid off and bake the oats for 35-40 minutes in a preheated 350° F oven. Let ’em cool down for a bit, and then dig in. So good! And leftover cold baked oatmeal is pretty darn delicious too. 1. 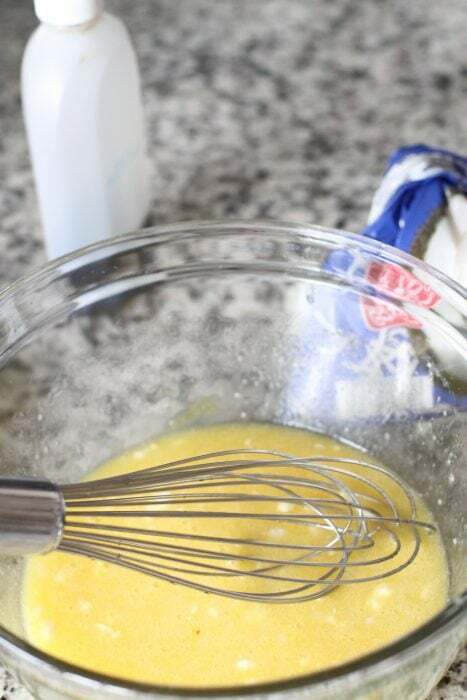 In a large bowl, combine butter/oil, sugar, vanilla, and eggs, and milk. 2. In a separate bowl, mix oat, coconut, baking powder, and salt. 3. Add oat mixture to wet ingredients, and stir to combine. 4. Fold in frozen fruit, and transfer mixture to a greased 8×8 inch dish. Cover and refrigerate overnight. 5. In the morning, bake in a preheated 350° F oven for 35-40 minutes. I can’t get behind olive oil in sweet baked goods, either. On my roasted vegetables I’m all for it, but otherwise? No. Unfortunately, I can’t get into baked oatmeal, either. Something about the texture just doesn’t seem right to me. Too chewy or something. I agree about the baked oatmeal. I have tried so hard to like it, but it is just not my thing. Glad I’m not the only one! 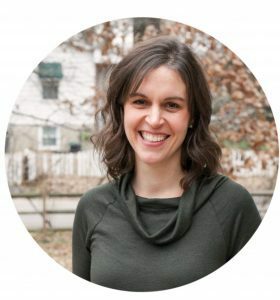 I got burned out on oatmeal when allergic to wheat with my second pregnancy, but I like using rolled oats, following the microwave directions on the box and throwing in a handful of whatever dried or frozen fruit we have on hand. THis looks like a delicious snack lol.. thats what i will be making for ! I just made a pumpkin oatmeal that used 1 cup of applesauce and 1 cup of pumpkin (plus cinnamon/nutmeg)….NO sugar at all and it was delicious! That sounds really simple, gun, and delicious. I usually eat oatmeal by itself since I try to avoid sugar. I add fruit sometimes, but I prefer to eat fruit by itself too. Gotta try this recipe one day. Thanks for sharing, Kristen! Oh goodie, I was waiting for this post. I have a partial bag of leftover coconut in my freezer and actually have all the ingredients I need for this. My husband loves coconut, but doesn’t like oatmeal all that much, so maybe I can bring him around with this recipe. I love easy breakfast ideas and plan to post some of my favorites on my blog soon. Oatmeal is so versatile! I normally dislike baked oatmeal, let’s call it what it is, oatmeal cake. However my friend also changes it into a real baked oatmeal with fruit. I like that and it’s not oatmeal cake. That sounds really good. I’m the only oatmeal fan at my house, but this sounds like an easy, good breakfast for when I have overnight company. As for olive oil, I had to search for it, but I found “light” or “light tasting” (I think it is Newman’s Own — sorry, I’m not sure about that) olive oil doesn’t give that strong taste to dishes. I needed it to make homemade mayo — I’d tried making mayo before with extra virgin olive oil, and I just felt like it tasted too olive-y to use much. I’m pleased to report that the light tasting olive oil didn’t impart any flavor to my mayonnaise — it just tastes like mayonnaise. Is there a reason that it needs to be refrigerated overnight? I would prefer to cook then and reheat for morning? We are up and out of the house. Kids eat breakfast at daycare and we eat at work. I would imagine the overnight time just helps the oats to soak up the liquids. But you could try baking it right away and see how it goes? What’s the worst that could happen? I can’t imagine it would be terrible. I just made a “carrot cake baked oatmeal” that was absolutely fantastic, found the recipe on Budgetbytes. I will have to give yours a try! 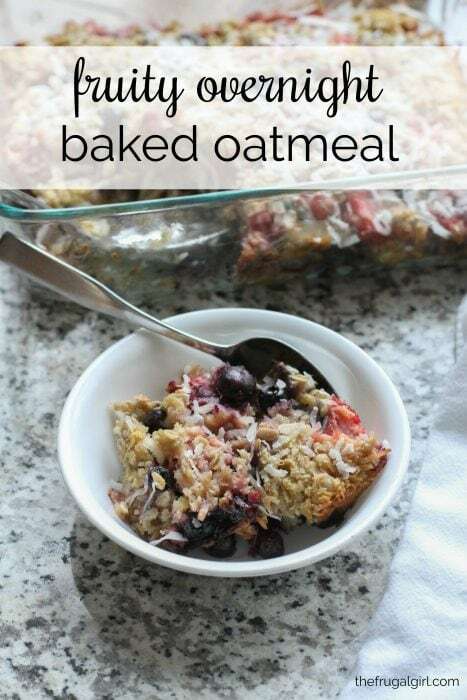 Baked oatmeal is the only sweet oatmeal I like. I’ve actually never added more than 1/4 cup of sugar. If you want to reduce the processed sugar further you could shred an apple into the mix. I did that last time and forgot to reduce the sugar; it was very sweet. I generally prefer savory oatmeal with fried or scrabbled eggs on top with leftover cooked or frozen veggies. I’ve made a savory baked oatmeal before too: carrots, kale (I know the FG family does not like cooked greens), and nuts. I wish I liked cooked greens, but alas, I generally do not. I do eat raw greens in smoothies and salads, though. I like the sound of coconut oil too. I use it all the time in my granola recipe, and I think it adds a great flavor. It depends how much I think ahead! Since this doesn’t need a blast of oven heat like yeast bread does, my favorite thing is to just put it in the oven as I turn the oven on, and while the oven heats up, it gradually heats up the oatmeal. I have an electric oven, which takes about 8-10 minutes to get up to temperature. We had blueish-green blueberry oatmeal this morning!! This looks really good, but I’d sub plant milk and avocado oil…and I’m not sure what I’d replace the eggs with. Maybe flax eggs? I bet raspberry is amazing! I make baked oats with plant milk and no eggs. it works just fine. 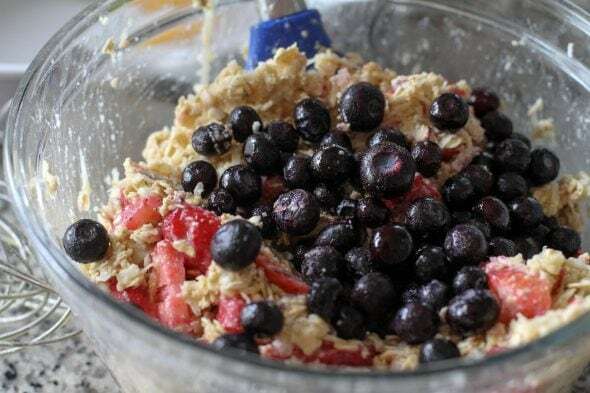 We cut up an apple in the bottom of the pan, then mix about 1/4 cup sugar with a couple of cups of oats, maybe some nuts, and some frozen blueberries or other fruit. Oh, my sister puts in raisins and craisins. Then pour rice milk (or whatever milk) over it (enough that everything is wet, not so much that anything floats) and bake it right then. The apples carmelize on the bottom, and everything else bakes up great. And no eggs (I have nothing against eggs, but they hate me something fierce). Coconut sounds fun! I think butter sounds like it would be a lovely thing in there! I love that it is infinitely variable! While I love olive oil for cooking, I agree that I don’t find it a good match for baking…the only exception being, my (Italian) great-aunt made the best almond biscotti, and I found out that her “secret ingredient” was mixing olive oil in with the butter! Who knew? This looks yummy! We usually cook our oats on the stove every morning, so this could be a pleasant change. Oh no way, I thought I was the one that wasn’t into olive oil. I hate the oil based salads (which many are…) it’s just weird to me…oil…with green stuff? It’s not healthy but…I’ll take the ranch and caesar. Thanks for the recipe!! Looks delish. 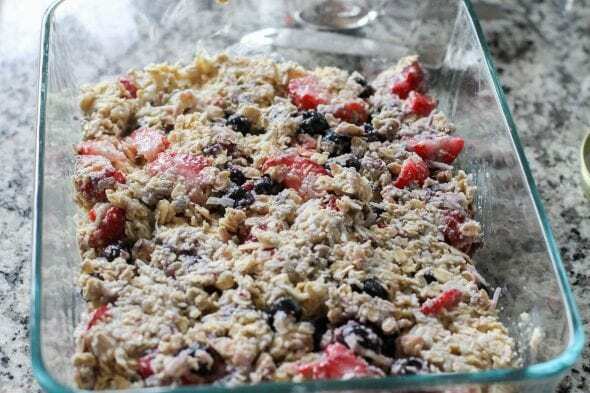 A friend dumps his baked oatmeal by scoopfuls on a cookie sheet. It makes a good grab and go breakfast. I’ve always had a rough time eating oatmeal. I’m not a fan of baked oatmeal, but I’ll eat just a regular ol’ bowl of oatmeal with toppings. Roasted coconut is the best-kept secret to a good bowl of oatmeal! Life changing. looks good but I’d skip the sugar and the salt and add THREE eggs – or maybe FOUR! These recipies are out of this world! You may like these! Super easy and very yummy! I pinned this recipe a long time ago and am making it for a side with quiche tonight. But my milk is still sitting here on the counter and I have the whole thing mixed together. When do I add the milk? I assume it’s supposed to be with the wet ingredients in step 1. Just thought you’d like to revise your steps. Thanks! I see now that it’s in the instructions you wrote in the body of the email, but in your condensed recipe at the end, it’s just not included. Oh, whoops! I just fixed it now; thanks for letting me know.